Poison (also known as poisoned water, Poison Bog or Poisoned Bog) is a liquid hazard found in several Mario games. It is commonly purple, and in most appearances, coming into contact with it will cause the player to lose a life or inflict damage, similar to lava. 1.2.2 New Super Mario Bros. 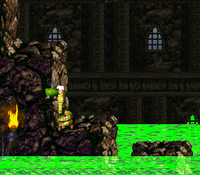 In Donkey Kong Country, the level Poison Pond takes place in a green toxic pond. However, it is harmless to Donkey Kong and Diddy Kong, just like water. 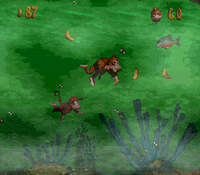 In Donkey Kong Country 2: Diddy's Kong Quest, a poisonous liquid appears quickly rising in Toxic Tower. If Rattly, Squawks or Squitter touch the liquid, they take damage until they lose a life. Also, in all three swamp levels, while the water is not shown as poisonous, Diddy and Dixie Kong nonetheless cannot swim in it and instantly lose a life. 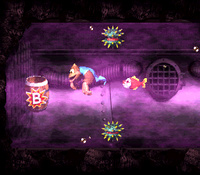 In Donkey Kong Country 3: Dixie Kong's Double Trouble!, poisonous water appears in Poisonous Pipeline. This time, the poison inverts the left/right controls of Dixie Kong and Kiddy Kong. Upon jumping out of the poison, the apes instantly go back to normal controls. In Super Mario Sunshine, poison appears in a secret area found within Delfino Plaza. In this area, Mario must ride on a leaf down the poison in order to collect eight Red Coins. In this instance, touching the water is instantly fatal. 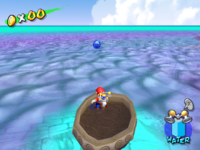 Additionally, in certain episodes of Bianco Hills, Ricco Harbor, and Noki Bay, the water is polluted and can still damage Mario. Poison in New Super Mario Bros. In New Super Mario Bros., poison can be found throughout several stages, mostly in the forest worlds World 4. In this game, it's purple and behaves the same way as lava. Dorrie and Koopa Troopas appear to be resistant to poison. In Super Mario Galaxy, an enormous planet made of poison that can kill Mario instantly is found in the Bubble Breeze Galaxy. It is also found in the Luigi planet from Toy Time Galaxy. An element similar to poison called dark matter appears in Bowser's Dark Matter Plant. 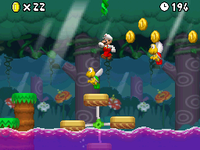 In New Super Mario Bros. Wii, poison can be found throughout several stages, mostly in the forest worlds World 5. It retains its appearance from New Super Mario Bros. Koopa Troopas and Big Wigglers are resistant to poison. In Super Mario Galaxy 2, dark green-colored poison is found in Boo Moon Galaxy (in the Sinking Swamp) and in Mario Squared Galaxy. In Super Mario 3D Land, World 2-2 and Special 6-3, both underground levels, contain poison. Poison reappears in New Super Mario Bros. 2, again in forest-themed levels. As a new trait, they can rise and drop in World 3-4. Porcupuffers are resistant to poison. Poison returns in the game New Super Mario Bros. U, where pools of poison surround Soda Jungle, having the same look. Poison also appears in New Super Luigi U. As in New Super Mario Bros. Wii, Big Wigglers are immune to the poison. Poison makes its next appearance in Super Mario 3D World. The stages in which the hazard mainly appears are Piranha Creeper Creek and Deep Jungle Drift. Poison returns once again in Super Mario Run, being introduced in the version 3.0.4 update for the game. It appears in the level Spike Bar Jungle of World Star. A new enemy called Poison Bubbles also appear, where they jump in and out of the poison. Poison appears in Super Mario Odyssey, where it can be found in the Sand Kingdom, the Lost Kingdom, and Bowser's Kingdom; touching it instantly depletes the Health Meter. Mario can safely ride Jaxi over poison. In the Wooded Kingdom, puddles of poison can be found on the ground, and touching one of the puddles causes Mario to lose a section of his Health Meter. Throwing Cappy at a puddle will cause some of it to go away, which can reveal invisible coins. Poison Piranha Plants can spit poison, which will create puddles when it hits the ground. Poison appears as a course element in Super Mario Maker 2. 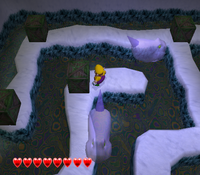 In Wario World, poison appears in Unithorn's Lair. In this game, it does not damage Wario, but rather cause him to bounce around the room and lose coins while doing so. The poison appears mostly translucent, but with a shining or bubbling surface. Poison appears throughout World 3 in Paper Mario: Sticker Star. It is created by Gooper Blooper, and it will disappear once Gooper Blooper is defeated. Wiggler, Snifits, and Cheep Cheeps can stay in it without taking damage. Poison appears in Plum Park in Paper Mario: Color Splash. The water was poisoned due to Petea Piranha poisoning it from inside a Teapot. Once Petea is defeated, the poison changes to normal water. Poison appears in Mario & Luigi: Dream Team in Somnom Woods. Falling into it has the same result as the player falling onto spikes elsewhere in the game. Oddly, in this game it appears to be electrified. Poison returns in Captain Toad: Treasure Tracker with the same appearance as Super Mario 3D World. ↑ New Super Mario Bros. U manual, pg 11. ↑ Paper Mario: Sticker Star manual, pg 9. ↑ New Super Mario Bros. U Prima Official Game Guide, pages 124, 125, 132, 136, 137. This page was last edited on April 11, 2019, at 10:30.